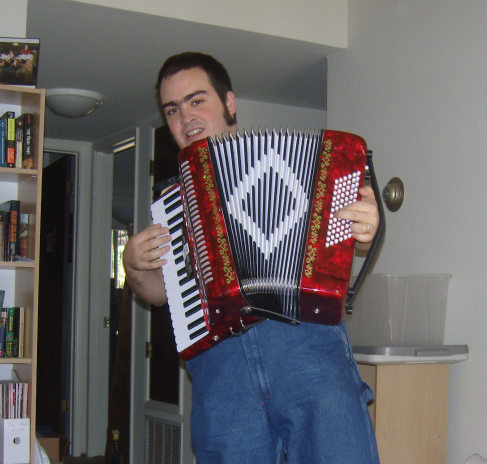 I’ve been learning to play the accordion. When you’re playing the accordion, your left hand is pushing buttons to play the chords of the song and keep time, while your right hand plays the main melody on a piano keyboard. They’re playing different parts and using different interfaces to do it. There’s also a third activity, the alternate squeezing and pulling motions needed to keep air flowing through the reeds; the moment you stop doing that, the sound stops as well. The squeezing and pulling soon became automatic; I don’t even think about that anymore. My biggest trouble is doing the left-hand and right-hand parts at the same time. As soon as I look at a new musical score, I can fairly easily play just the left-hand part, or just the right-hand part. One activity with full conscious attention. But getting the two parts to happen together takes hours of intense practice per song. Each part demands my full conscious attention, but I am neurologically incapable of doing that. It’s like trying to run through a wall. A way around the wall is to learn one of the two parts (usually the chords) so well that I can do it automatically, without thinking, and focus my conscious mind on the other part. The other way around the wall is to “chunk” segments of both parts together. For example, a certain song might have the left hand playing eighth notes of G, G-minor each time the right hand plays a B-flat quarter note. I can learn that as a single chunk and then perform the song as a sequence of chunks. This essentially turns a multitasking operation into a single-tasking operation with more difficult pieces. I’m willing to put in all this effort because music is a fun hobby and I like the way it sounds when I finally get the two hands playing together. Whereas learning a software interface (other than a game) is nobody’s idea of a fun hobby, and is generally something that people want to get over with as soon as possible so they can focus their entire conscious mind on creating their content or otherwise doing their work. Of course, your software is a shining beacon of usability that would never require users to multitask… or would it? Does your interface ever, for instance, require users to remember some important piece of information while also navigating a maze of menus and dialog boxes? To you, that navigation may be something you can do automatically, unconsciously, leaving your conscious mind focused on the important stuff. But to users who haven’t yet memorized the chords, so to speak, that navigation still requires conscious thought, and might force the melody right out of their head.